Google started rolling out a new feature for Google Calendar users, making it easier for groups and co-workers to collaborate. Called appointment slots, the Google Calendar functionality allows you to set up times and dates in your calendar, so collaborators can pick and choose the most convenient times for them as well. 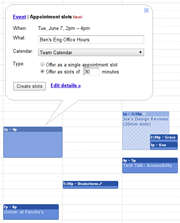 Appointment slots in Google Calendar are suitable for both individual and business users. To create appointment slots you just have to click anywhere in your calendar and select the option. You can then create a single block of time or split it into smaller chunks, depending on how long your appointments usually take. "At Google, many people are already using appointment slots to manage their office hours or even schedule appointments with on-site fitness instructors," Google software engineer Irene Chung explained in a blog post. "I'm pretty excited to tell my hairdresser about it," she added. Google has made it so that each calendar in your account has its own personal appointments sign-up page, which can be embedded on a website or shared via email/IM with a URL (the URL can be found at the top of the appointment slots setup page when you edit details). After you have your appointment slots set up and shared, visitors to your sign-up page will see their calendar overlaid over your slots. Once someone signs up to one of your appointment slots, a shared event is created and added to both yours and the other person's calendar. Google says the appointment slots feature started rolling out Monday and should reach everyone over the coming days.